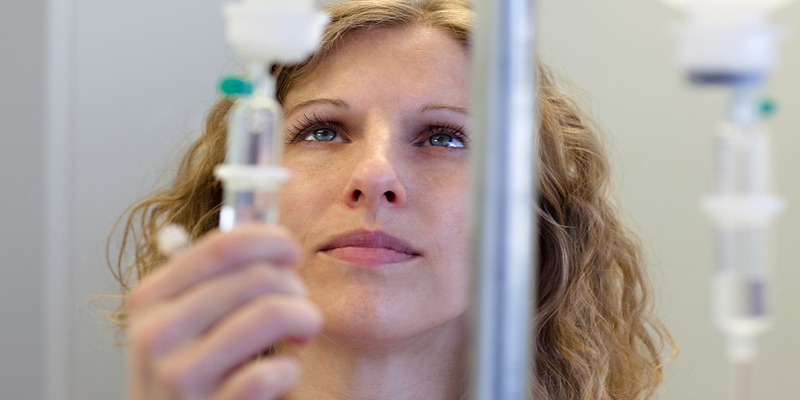 Infusion nurses are registered nurses who specialize in administering medications and fluids via infusion. They monitor patients, manage their tubing, maintain arterial catheters and stay aware of potential drug complications. It’s a unique specialty, requiring high levels of technical skill and excellent bedside (or in many cases with infusion nursing, “chairside”) manner. For nurses who are looking for a career change or students planning their next step after graduation, infusion nursing is a promising option. It’s also an increasingly popular specialty. According to Healthcare Traveler, the demand for infusion nurse services is expected to rise 26 percent by 2020, due in part to new medical technologies, the aging of America and several anticipated cost-saving initiatives required by the Affordable Care Act. Flexibility, adaptability and quick thinking are keys to excelling in the ever-evolving world of infusion nursing, where nurses must be prepared to both work autonomously and be a part of interdisciplinary teams. Infusion nurses have a particular opportunity to work closely with patients and their families during difficult, sometimes painful, parts of their treatment. Ankrom notes a big part of the infusion nursing role is to educate patients and their families about their care. It requires translating complicated medical knowledge into terms that patients (even pediatric patients) can understand. Ankrom often encourages her nurses to open up to their patients in order to develop a stronger relationship. Infusion nurses practice in any setting where patients receive medication or fluid infusion treatments, including hospitals, long-term care centers, clinics and home health agencies. During her career, Ankrom has worked in many of these settings, but currently works in an outpatient clinic. Outpatient clinics can be a valuable option for patients with an ongoing condition that requires regular infusion treatments. After nearly 20 years of practicing nursing, Ankrom still lights up about her chosen specialty. To learn more about infusion nursing, check out Ankrom’s interview in the Campaign’s new “Day in the Life” video below or her interview on Nursing Notes Live.